Valid for all active, reserve, National Guard, and retired military personnel plus active and retired police and firefighter personnel, including volunteer firefighter and Border Patrol. March 1 - April 30, 2019. 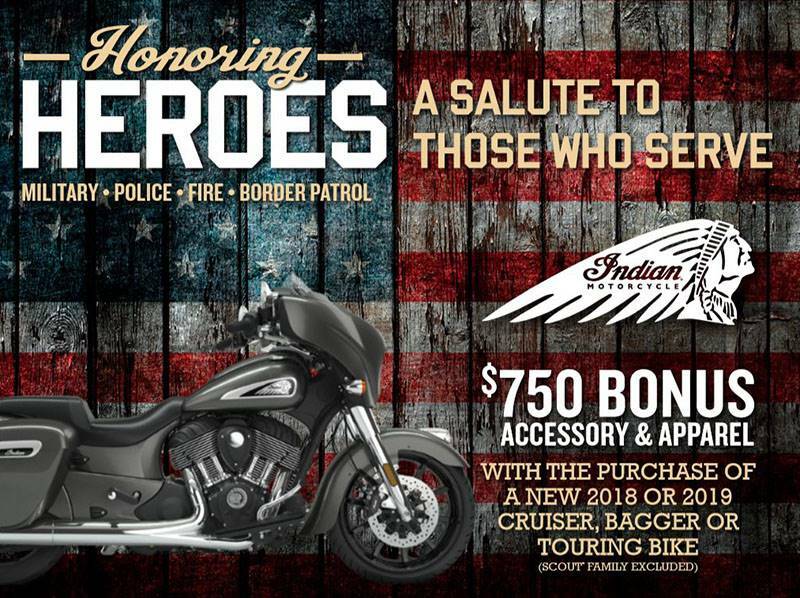 RESTRICTIONS: Offer good for up to $ 750 MSRP US or $ 750 MSPR CND in Indian Motorcycle® Parts, Garments and/or Accessories with the purchase of a new 2018 or 2019 Indian® Cruiser, Bagger, & Touring model. Not valid on non-Indian Motorcycle® accessories or apparel, or on purchases from IndianMotorcycle.com. Purchase up to $ 750 in PG&A before taxes will qualify. Redeemable with proof of the following: 1.) Proof of Active/Retired Military Service 2.) Valid Canadian or US Armed Forces ID 3.) Proof of valid DD-214 or comparable official discharge papers showing honorable discharge 4.) Valid Police or Firefighter ID. The program is available to all active, reserve, National Guard and retired military personnel plus active and retired police and firefighter personnel, including volunteer firefighter and Border Patrol. Coupon is not redeemable for cash. Limit one coupon per customer. Paid out at 100% to dealer (up to $ 750). Indian Motorcycle® is a registered trademark of Indian Motorcycle International, LLC. Always wear a helmet, eye protection, and protective clothing and obey the speed limit. ©2019 Indian Motorcycle International, LLC.